Even Heavy Rain, the PlayStation 3 exclusive title that may or may not be a game, isn't safe from pre-order bonuses. SCEA's Jefferson Dong recently announced via the PlayStation blog that the official pre-order bonus for Heavy Rain will be a code to unlock the game's first episode of DLC for free. Heavy Rain is a PlayStation 3 exclusive from Quantic Dream, the developers of Indigo Prophecy, that aims to become less of a game, and more of an interactive story. 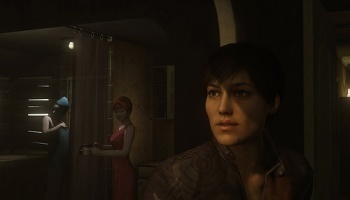 Heavy Rain's DLC episodes will be called The Heavy Rain Chronicles. Pre-ordering the game will net players Heavy Rain: Chronicle One - The Taxidermist, normally valued at $4.99. This will also allow access to The Taxidermist from day one of Heavy Rain's release, while it won't go up for purchase until a later date. A second chronicle is also planned, but with no details yet revealed. Each of The Heavy Rain Chronicles will encompass a stand-alone story featuring a character from Heavy Rain, taking place either before or after the retail game. They will be just as choice and risk filled as Heavy Rain, with multiple outcomes possible. The Taxidermist features investigative journalist Madison Paige, the woman that was in one of the larger Heavy Rain demos already shown off, in one of her first cases investigating a serial killer. It's meant to be an update/expansion to the already shown demo, where Paige enters the house of a suspected killer. Heavy Rain is scheduled for release on February 16, 2010 in North America, February 18 in Japan, and on February 26 in Europe. While you wait, feel free to read through Escapist Senior Editor Susan Arendt's hands-on preview.